Ring made by weaving blue superduo beads, o-beads silver-colored, seed beads and blue half crystals. Central transparent Rivoli crystal. Strap made with superduo and seed beads. Entirely handmade in Italy. 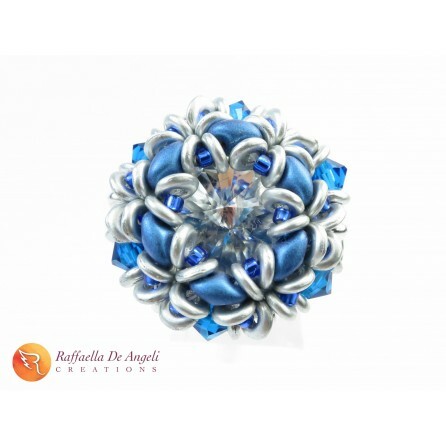 Ring made by weaving blue superduo beads, o-beads silver-colored, seed beads and blue faceted half crystals. Central transparent Rivoli crystal. Strap made with superduo and seed beads, 100% hypoallergenic. Entirely handmade in Turin, Italy.